Sky has started to trial #WatchOnSky, a brand new tool on Twitter that lets Sky customers watch or record TV shows, sporting events and movies by simply clicking icons contained within a Tweet. 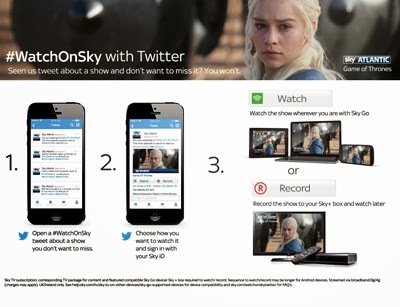 Twitter users who see #WatchOnSky on Tweets from Sky can expand the Tweet and tap on an icon that directly links to Sky’s mobile TV service Sky Go to start watching the show. Alternatively they can tap the Sky+ ‘R’ to remotely set their Sky+HD box to record. The launch of #WatchOnSky marks the first time that a British broadcaster has created a service which lets users access live TV and set recordings via their Twitter timeline. The new service builds on the popular Sky Go and Sky+ apps that give Sky TV customers more control of their TV viewing. The Sky+ app lets customers flick through hundreds of channels and record upcoming shows, as well as browse through thousands of hours of on demand TV and movies to download to their Sky+HD box. Sky Go lets customers watch up to 54 channels on their mobile devices – the widest selection of channels available on the move from any provider in the UK.